Image caption "Did you hear something, Baldur?" The committee in charge of Iceland's official register of horses has put its foot down after an owner attempted to register an animal with a "foreign" name, it's been reported. While some Icelandic newspapers expressed surprise that such a committee even exists, IceNews website reports that the International Federation of Icelandic Horse Associations (FEIF) has recently passed a rule that names must be of Icelandic heritage for them to be included in the official database. 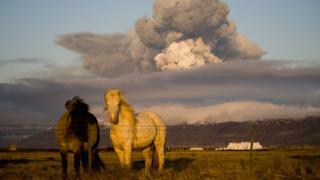 It comes after owner Gudrun Hrafnsdottir was told that the two-person panel had rejected the name Mosan for her three-year-old mare because it "conflicts with Icelandic grammar rules", Frettabladid newspaper says. But the rules are there for a reason, says Jon Baldur Lorange of WordFengur, the studbook for Icelandic horses. He says the two-person Horse Naming Committee was set up after people tried to register obscene names that left WordFengur "with no choice but to step in". There's a commercial reason as well. "Foreigners don't want to buy Icelandic horses with foreign names," Jon Baldur explains. A dip into the database reveals the policy in action, with horses variously named Baldur (Odin's son in Norse mythology), Dokkvi (Dark), Alfgrimur, and Bjork. The rules only apply if the owners want their horses to appear in the database for sale, breeding or pedigree purposes. Otherwise, Icelanders can still call their horses any name they like.